I was unpacking some clothes from down in our basement the other day. 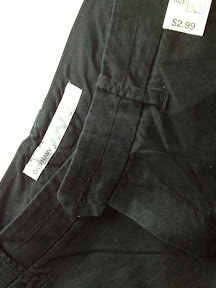 I came across a black pair of pants that I had got from Goodwill before we moved from our old house. I got them with the intention of making them over. But then we sold our house in two days and never got the chance to do anything with them. But now is the perfect time to do it. Being creative with things I already own is right up my alley right now. 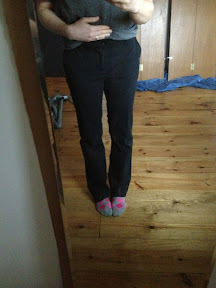 I have black dress pants. But I don't have skinny black pants. So that is what I am doing with them. I turned them inside out and put them back on. Then I pinned along the outside of my leg from just above the knee all the way down. I just pinched it relatively tight and stuck in the pin. But just to warn- be very careful taking your pants back off. Ouch! I sewed along the pins and cut off the excess after trying them on. I rolled them up a little in this photo. 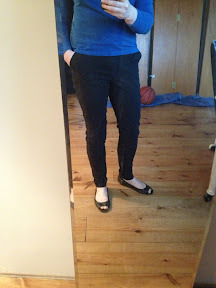 I've heard bare ankles are the thing for spring. I'm not trying it until spring warms up a little though. Not bad. I'm not crazy about the fit of these pants. They are a little big on me. Maybe I've lost a little weight since our move...but doubt that's it. Try it! 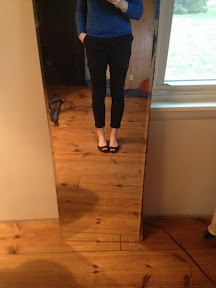 Revamp an existing pair you already own or go thrifting for some cute, colored and cheap dress pants. The perfect thing for spring!